Babel, Joseph D 28 laborer OH? Beaver Co., PA 1833 July 1, 1915 Wellston OH X 85614073 Based on ACWRD pension listing, soldier settled in OH; death date may be around 1882-1884 based on widow (Minerva Babel) pension application from WV. Death date on pension card is suspect or widow's claims are suspect. 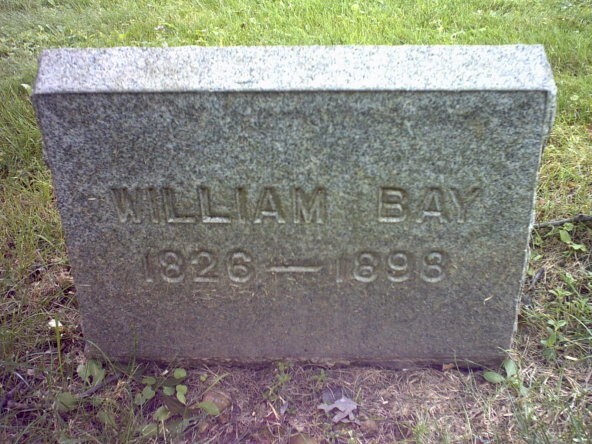 Findagrave info contradicts ACWRD info. Bacon, William M 35 Allegeheny Co., Elizabeth 1823 December 25, 1908 Smithton PA X 58481778 Other grave stone (SUVCW) Per ACWRD, died in McKeesport, PA; buried in Greenock, PA, died at age of 85. Banks, Samuel A. F 21 farmer East Brook, Pa. June 21, 1844 December 31, 1916 Zephyr Hills FL X 33329576 Per ACWRD, birth date and location; sick in hospital when regiment re-enlisted in January 1864. Barber, John S. E 45 fair 5' 7" blue sandy Moulder Mercer Co. E. Lackawannock Twp. PA Bulter Co., PA 1817 July 4, 1898 IN not found X Wounded at James Island in leg, wounded at Spottsylvania CH in arm per ACWRD. Barber, Samuel E 19 light 5' 7 1/2" blue brown farmer penna. not found No information found. 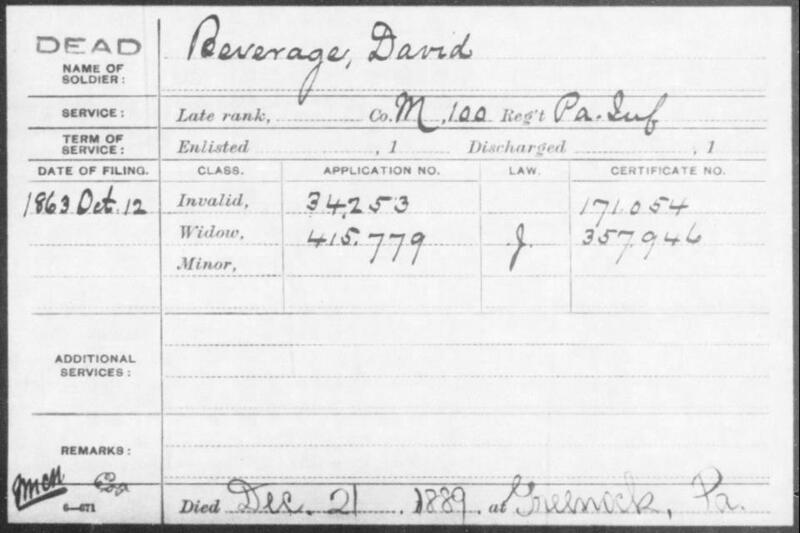 Barker, Milton G 26 Not found 1864 Recruit, no other info available. Barkhouse, Benj. B 28 June 24, 1916 Buch WV not found 1865 Draftee. Barner, Adam G 26 Not found Per ACWRD, March 1865 subsitute, deserted July 1, 1865. No other information available. Barnes, Thomas C 23 dark 5' 6" blue black Coal Miner Penna. Dec 23, 1840 April 19, 1912 141795879 Per ACWRD, wounded at Spottsylvania CH. Barnett, Philip S. A 18 Sept 14, 1846 October 10, 1930 Austin PA X 27305936 Middle name "Shoaf"
Barr, James A 21 W. Middleton, PA Aug 28, 1838 March 5, 1919 Norfolk VA 89081522 Birthdate/location info per ACWRD--also lived in Wheeling WV. Bathurst, Henry A. M 35 Laramie, Cheyenne WY not found Per ACWRD, sick on steamer West Point, when it sank in the Potomac on Aug 13 1862. Beadel, Conrad G 33 Germany May 7, 1828 June 19, 1900 Dayton OH not found "Bentel? ", "Bendel"? ; discharged for disability, born in Germany. Beams, Samuel G 30 Franklin Co., Lurgan March 27, 1831 May 30, 1900 Franklin Co. PA X 113984033 Per ACWRD, 1865 draftee or possibly substitute--more research needed. 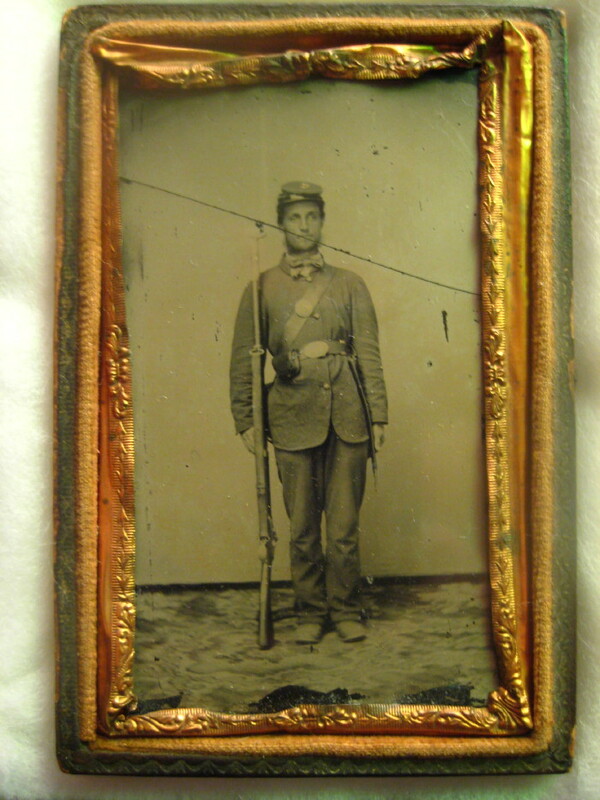 Beattie, Thomas A 24 not found 1865 recruit--listed as POW at Fort Stedman 3-25-1865 per ACWRD. Beighley, Sidney P. F 18 farmer Princeton, Pa. March 16, 1848 Dec 25, 1931 Adams Co. OH X 183992159 buried in Oak Park Cemetery, Lawrence Co. PA. ACWRD states he was 53 years old at enlistment? CW Veterans Card says 18. Bell, Moses M. A 20 Allegheny Co. Chartiers PA W. Alexander, pA March 27, 1917 Municipal Waste, Pittsburgh PA X 138412149 X Per ACWRD, after war lived in Carnegie. 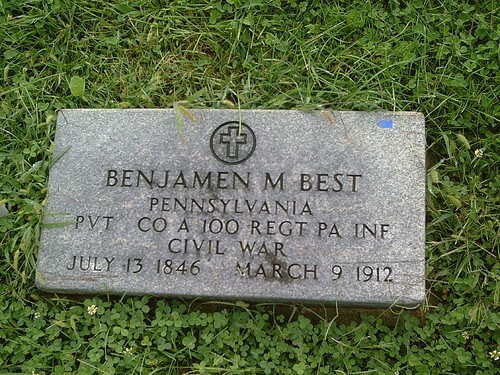 Best, Benjamin A 18 July 13, 1846 March 9, 1912 Pleasant Hills MO X 65169164 X death certificate Wounded Oct 2, 1864 at Poplar Grove Church per ACWRD. Best, John I 42 X Sept 21, 1862 Nat Mil Asyl Cem DC X 32235995 he said as he was dying "Oh, ye Comrades, look to Christ and die as I am without a struggle". died of wounds rec. 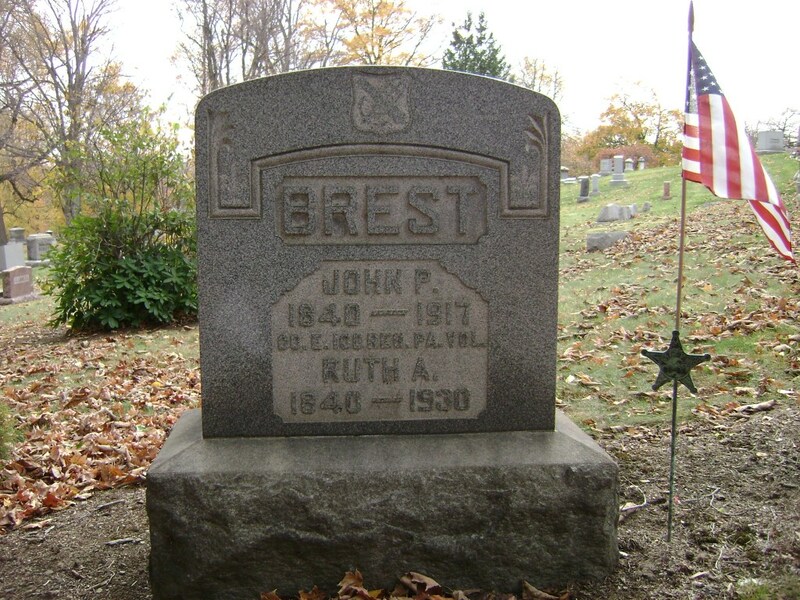 Aug 29-Sept 1, 1862; great biographical info on findagrave.com page. Billings, Stephen A 21 March 3, 1906 Washington Co PA not found Death location per ACWRD. Black William G. F 18 fair 5' 8" blue dark farmer East Brook, Pa. PA Nehshannock Twp, PA Feb 2, 1845 October 13, 1918 New Castle PA X 16059674 Per ACWRD, birth date and location; buried in Briar Hill Cemetery, Lawrence Co. PA; age 16 at enlistment per ACWRD; also discharged in 1862 for disability and re-enlisted 1864. Black, James W. B 23 light 5' 10" blue dark farmer Mercer Co., Pa. Pa. June 30, 1864 Petersburg VA not found Killed 6-30-64 in action near Petersburg, Va.
Black, William F 18 dark 5' 7 3/4" dark brown farmer Scott twp., Pa. Butler Co., Parker Twp. pA Neshannock Nov 20, 1845 30-Aug-1925 Alhambra CA X 9622752 X Closeup image of gravestone with crossed 3-band rifle-muskets. Per ACWRD, after the war lived in Grove City, PA. Buried in San Gabriel, CA Cemetery, plot N-9, grave 1. Blake, John A 21 not found Jan 1865 recruit; mustered out with regiment 7-24-1865 per ACWRD. Blake, John Unacc 1865 recruit; listed as 'unaccounted for' in ACWRD. Bland, William G 19 1842 Aug 29, 1862 Bull Run VA 164084329 Per ACWRD, middle initial "P", killed at 2nd Bull Run 8-29-1862; genealogy info-buried in Zahniser Cemetery, Mercer Co.
Bleckney, Samuel S. H 18 31-Dec-1912 Blairsville PA X 95682245 1865 Substitute,mustered out with regiment 7-24-1865; no other information available. "Samuel S. Blakney"
Bloke, Elias E 22 not found 1865 Substitute, no other information available. Blomberg, Peter A. A 20 Feb 16, 1862 Beaufort SC 2947423 Per ACWRD: born in Sweden; died in camp while eating his supper; came to USA 3 years before death. Bogart, Zachariah K 18 9-Oct-1910 X 102453935 Listed as 1864 substitute in ACWRD. 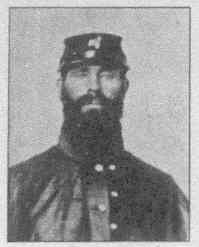 Bohl, Frederick G 30 Franklin Co., Guilford 1843 9-Sep-1920 Chambersburg PA 40222769 Per ACWRD, 1865 draftee. Bohlmen, Henry K 44 Germany May 28, 1817 July 1, 1889 Greendale PA not found Per ACWRD, buried in New Castle, PA in Greenwood Cem; "Bohlman"
Book, Joseph E. E 25 farmer Penna. Jan 3, 1863 Mil Asylum Cem DC X 32236112 No information found. Boon, Thomas F. A 21 not found No other information found. Boozle, Henry E 18 farmer Plaingrove, PA Nov. 25, 1862 Fredericksburg VA not found died per Oct. 15, 1884 reunion photo. Died in Co. Tent, per ACWRD. Bott, William A. H 32 dark 5' 7" blue dark laborer Duquesne, Pa. Germany July 1, 1828 7-Nov-1910 New Castle PA 138413388 Middle name "Adam", 3 years prior service in another unit (DLW--searched veteran's cards files--no other soldier found); Feb 1865 substitute for Frederick Fiskar? Fisher?, POW at Fort Stedman 3-25-1865. "William A. Bodd"
Bower, Henry H. K 24 8-Nov-1918 Reading PA 65090013 Per ACWRD, March 6,1865 substitute, absent without leave at MO July 24, 1865; gravestone on findagrave info indicates also served with Co. H, 104th PA; middle name "Harrison"
Bowers, Joseph M. D 18 dark 5' 3" blue brown farmer Allegheny Co., PA April 1, 1848 15-Apr-1927 Millersburg OH X 85215083 Birthdate per ACWRD. 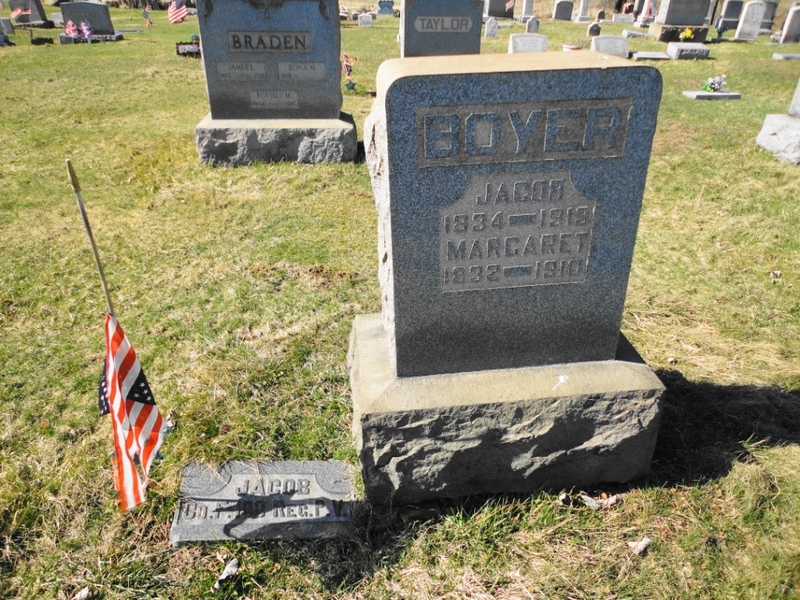 Name listed as "Bower" on findagrave page. Other information indicates same individual. Boyd, William D. D 21 light 6' grey light gentleman Beaver Co., Pa. not found Aug 21, 1861 enlistee, one of only a few Roundhads that enlisted 10 days ahead of the majority of soldiers; deserted 12-10-1862. Boyles, James A. E 18 Wagon Maker Lawrence Co. New Castle Feb 19 1843 Nov 4, 1890 Topeka KS X 22758030 Buried in Bennington Cemetery, Ottawa Co., KS; wounded at Chantilly 9-1-1862 per ACWRD. Bradshaw, Marion D 20 dark 5' 7 1/2" grey brown farmer Pa. 31-Oct-1916 Beaver PA X 46077122 1864 recruit, no other information found per ACWRD. Brady, John F 23 dark 5' 8 1/2" grey dark cooper Ireland Not found 1865 Subsitute, March 9, 1865; deserted May 15, 1865. Brandon, John H. C 18 light 5' 3" blue brown farmer Penna. 1847 4-Feb-1931 Cheyenne WY X 14079043 No other information found. Breast, John P. E 23 light 5' 9 1/2" blue brown carpenter X Lawrence Co. North Beaver Twp. PA Penna. Aug 14, 1840 19-Sep-1917 New Castle PA X 47193502 lost leg June 2, 1864 per Oct. 15, 1884 reunion photo. L. leg shot off at the knee. Breckinridge, David E 32 light 6' 1/2" grey dark farmer Liberty Twp, Mercer, PA Oct 15, 1831 Feb 10, 1865 Centreville PA not found Account of his wound by surgeon. 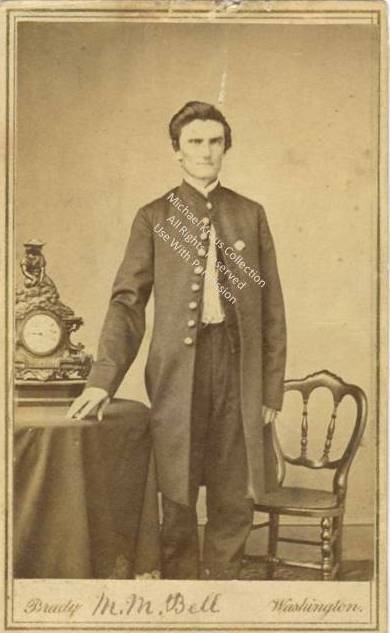 wounded in head--June 17, 1864, Petersburg, VA; died of his wounds after stays in several hospitals per ACWRD. Breckinridge, James C. E 21 light 6' 0" black black farmer Penna. July 23, 1843 March 12, 1887 Mercer Co. PA not found toe amputated based on accident and subsequent gangrene. Info per ACWRD. 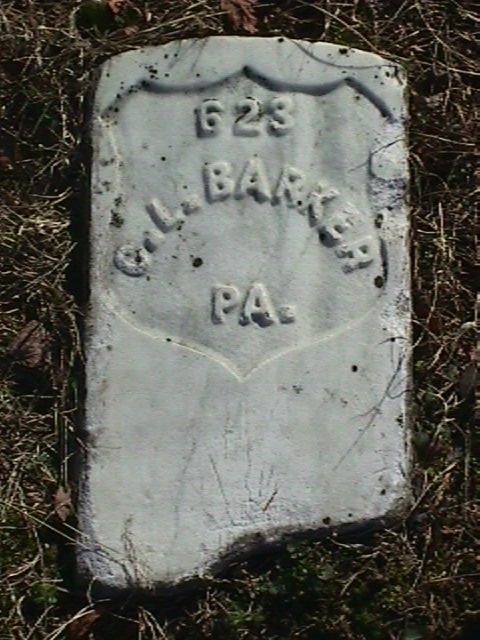 Buried in Citizen's Cemetery, Mercer Co.
Bricker, Samuel E 24 Franklin Co., Montgomery Twp. PA 20-Apr-1900 Mercersburg PA not found 1865 Draftee, no other information availalble. Brookiins, Castle A 36 not found 1865 Substitute; unusual name turns up nothing! Brown, John I 38 not found No other information found. Brown, John K 38 not found No other information found. Brown, Wash'n S. E 25 carpenter penna July 13, 1863 Jackson MS not found died per Oct. 15, 1884 reunion photo. found dead by side of insane asylum at close of battle--no marks on body, died of heart failure. Info per ACWRD. 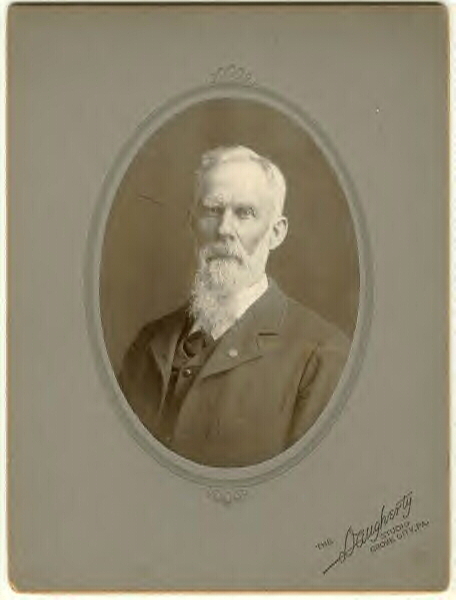 Brown, William B. D 23 Allegheny Co. Tarentum PA 29-Mar-1921 Tarentum PA not found Per ACWRD, was sick on steamer "West Point" when it sank in Potomac River Aug 13, 1862,. Brown, William H. E June 14, 1864 Alexandria VA X 426956 died of wounds rec May 12, 1864; Alexandria Nat Cem; grave 2,141. 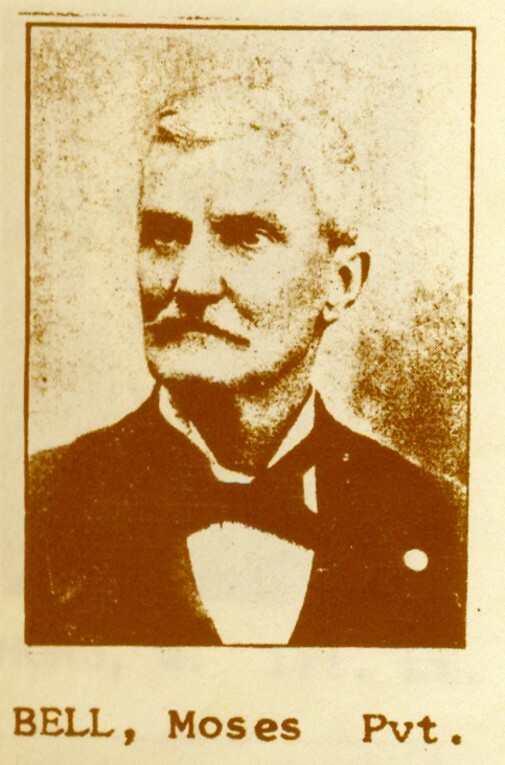 Brown, William K. C 43 farmer Feb 19, 1814 1905 not found Lived in Slippery Rock, PA after the war. Brubach, Philip H 31 not found Per ACWRD, wounded at Poplar Springs Church, VA, 9-30-1864.; discharged for wounds (date not stated)--absent at muster out. Bruce, James I 18 not found No other information found. Bruce, William J. E 22 light 5' 5" blue light farmer Penna. March 20, 1864 Pittsburgh PA not found buried in United Baptist Cem, Scott Twp, Lawrence Co. PA; sick in camp near Braddock, taken to hospital in Pittsburgh. Bruester, Henry K 29 not found Or "Brewster"; no other information found. Buchanan, James B 19 farmer Mercer Co., Pa. Worth PA Mercer Co. PA Nov 8, 1841 15-Sep-1904 New Wilmington PA 121922535 Per ACWRD, buried in Neshannock Cem, Lawrence Co. PA; middle initial "W". Buchanan, Wm. R. G Aug 1878 Not found 1861 Recruit, no other information available. Buckalew, Abraham M 19 Allegeheny Co., Pittsburgh 19-Dec-1905 Marion, Grant Co. IN X 2860681 buried in Marion Nat Cem. Buckelew, Abra'm H 21 Allegheny Co., Pittsburgh 19-Dec-05 Grant Co., Marion IN X 2860681 death date on findagrave info is the same as 2nd source; need to confirm. Buckley, Daniel G 20 Mercer Co., Worth PA Worth Twp, Mercer Co., PA 1842 9-May-1916 Venango Co. PA X 26959575 Per ACWRD, lived in Henderson, PA after the war; also genealogy information on ACWRD and findagrave listings. Buckley, Enoch G 28 Venango Co., Mineral 1840 29-Jul-1904 Venango Co., Raymilton PA X 26959858 Gunshot wound in back; per ACWRD, wounded at 2nd Bull Run 8-29-1862. Budsworth, Ralph F 27 dark 5' 4" grey brown laborer Canada Not found 1865 Subsitute, March 9, 1865; deserted May 15, 1865. Burdett, Oliver H. M 18 X Mercer Co.PA Dec 16, 1846 24-Oct-1924 Stoneboro PA X 138415354 Per ACWRD, 1864 recruit; birth date and location; age 17 at enlistment; buried at Unity Cemetery--Lackawanock Twp. 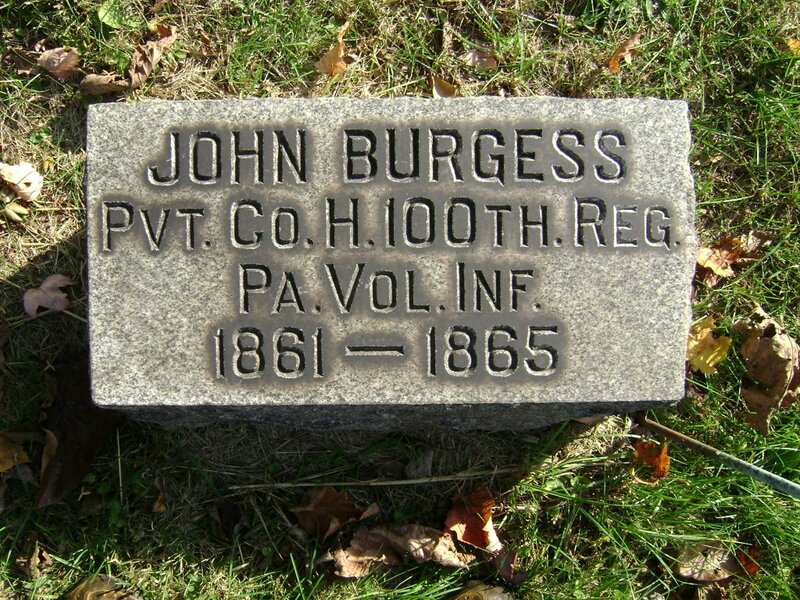 Burgess, John H 38 1824 1890 New Castle PA X 16049766 Per ACWRD, birth and death years, buried in Greenwood Cemetery, New Castle, PA; discharged for wounds (date and place not stated) per findagrave info. Burkins, John K 27 York Co, Chancerford Reading, PA May 9, 1837 14-Feb-1910 X 50425742 Per ACWRD, birth location; 1864 draftee; per findagrave info--middle name William; death date Feb 14, 1910 and birthdate. Burnes, Robert B 20 1845 21-May-1919 Maquoketa IA X 48175885 No other information per ACWRD. Burns, Elias F 20 1906 Ogalla KS not found Per ACWRD, died in Oghalla, KS, 1865 draftee. Burns, William K 27 Substitute - Deserted May 26, 1865 near Tennalytown, D.C.; No other information found--not listed in Bates Roster. 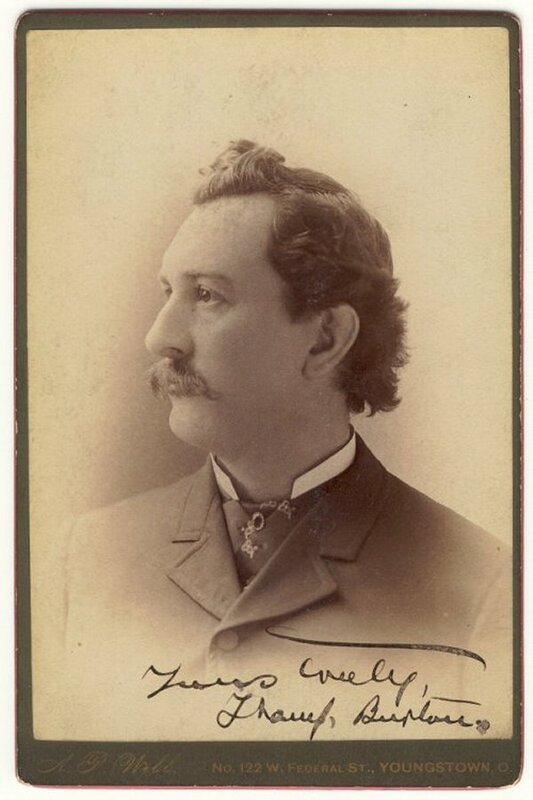 Burtner, John E. C 19 fair 5' 7" hazel black clerk Freeport, PA Oct 1, 1845 20-Mar-1917 Butler PA X 39916491 ACWRD--birth date and wounded at Weldon Railroad. 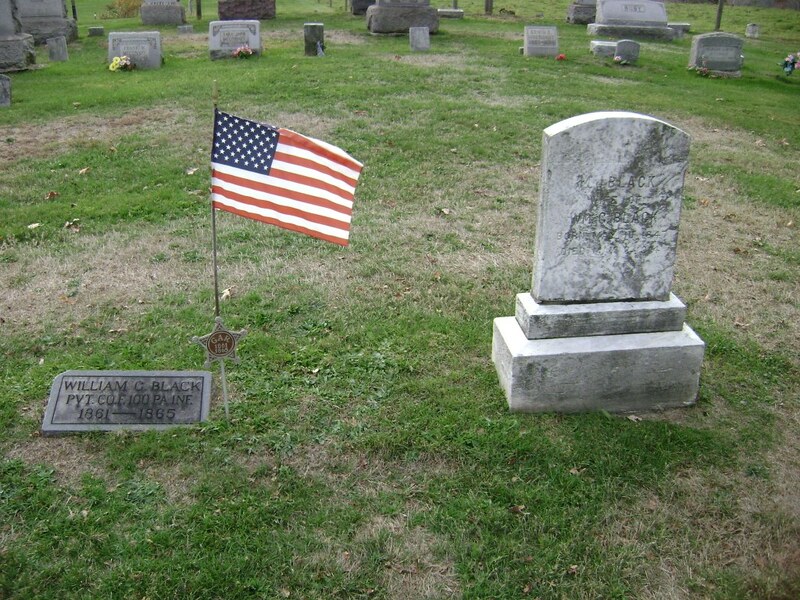 Burton, Thomps'n E 18 Salesman Schoharie, NY April 13, 1844 15-Feb-1909 Sheboyan MI not found X regimental color bearer; living in Youngstown, OH in 1901 per reunion article, per ACWRD he took the colors from wounded color sgt at Battle of South Mountain and retained them until sick in MS campaign. Bussler, Henry H 18 not found Per ACWRD, March 1865 Substitute--mustered out with regiment. Butler, William H. F 19 1911 not found No information found in ACWRD. Byers, James P. B 33 farmer Shenango, Pa. Pulaski PA Mercer Co. PA May 20, 1828 10-Jan-1904 Pulaski PA X 42821292 Per ACWRD, birth info, also buried in Pulaski cemetery and genealogy info.